- For mechanically and chemically non-aggressive fluids. - Automatic distribution of water with small or medium tanks (autoclaves) for irrigation. - Pressure increases in water mains. Pressed brass impellers or thermoplastic resin. Rotor shaft in stainless steel AISI 431. 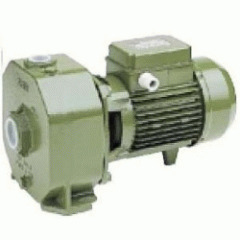 Asynchronous electric cage motor closed in an aluminium case and externally ventilated. Heads up to 85 m.
Maximum ambient temperature: 40 °C (contact our technical department for higher temperatures). UNI/ISO 2548 class C appendix B.